People said the Escape Shuttle was too hard to find after you had been playing for a while. Fixed that with an unlock. People Report'd bugs with "out of memory" errors on some phones. Added an option they can use to stop that from happening. Heard that people wanted a "big negative" award, so I added that. A new player sent me an e-mail saying that they had ignored intimidation for too long because they didn't see anything about fuel use. 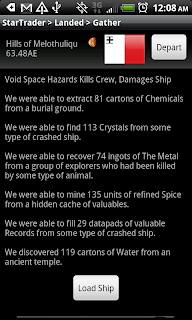 I updated the description to be more specific about what it does for deep space. There was a general feeling from many players that after we added the latest set of upgrades that the scarcity of upgrades was getting pretty bad, so we increased the number of available upgrades. There have been some threads about Water-Fuel, Reputation and other discussions. As a result we have increased the number of trade goods (in particular, water-fuel) found at indy worlds. The logic being that they are smart traders, know fuel is key, and produce it as much as they can.